Jewish family which flourished at the beginning of the sixteenth century in Rome, and the head of which, Mordecai, was a Spanish exile of the Angel family. His courteous manners won for him from the Roman nobles the surname "Galantuomo" (gentleman), a name which the family retained. About this time the family settled in Palestine, where it produced authors and other celebrities. Italian cabalist; born at Rome at the beginning of the sixteenth century; died 1560. Abraham, like his father and his brother Moses, rabbi of Safed, is represented by his contemporaries as a man of high character who led a holy life (comp. "Ḳab ha-Yashar," ch. xv.). He was the author of the following works: "Ḳin'at Setarim," a commentary on Lamentations, based upon the Zohar; it was edited by his son Samuel in the collection "Ḳol Bokim" (Venice, 1589); "Yeraḥ Yakar," a commentary on the Zohar, the first part of which (Genesis) was abbreviated by Abraham Azulai and included in his "Zohore Ḥammah"; "Zekut Abot," a commentary on the sayings of the Fathers, mentioned by Hananiah of Monselice in his commentary on the "Pirḳe Shirah." 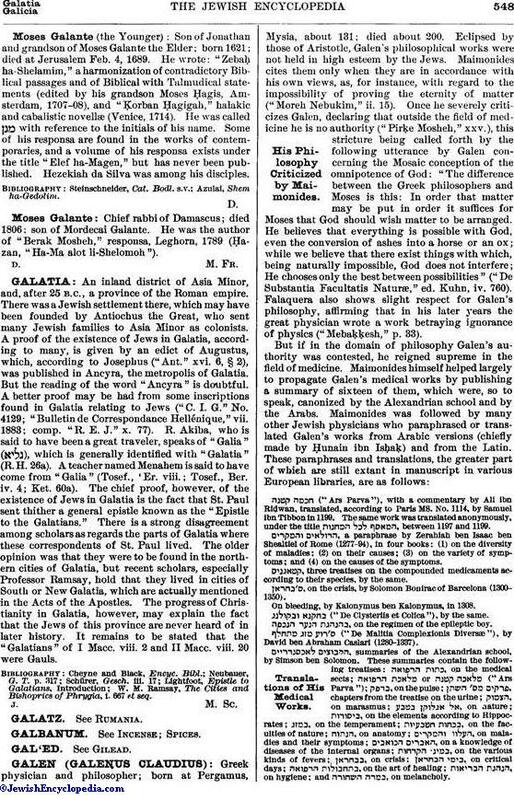 Galante was also the author of halakic decisions, which are still extant in manuscript. Being wealthy, he erected a splendid mausoleum over the tomb of Simon ben Yoḥai at Meron, which is still admired. Vogelstein and Rieger, Gesch. der Juden in Rom, p. 86. Chief rabbi of Damascus; died in 1781; author of "Gedullat Mordekai," a collection of sermons preserved in manuscript at Damascus (Ḥazan, "Ha-Ma'alot li-Shelomoh," p. 50). Son of Mordecai; born about the middle of the sixteenth century; died at Safed 1608. He was a disciple of Joseph Caro, and was ordained by him when but twenty-two years of age. He wrote: sermons for a wedding, for Passover, and for a thanksgiving service, printed with the younger Obadiah Bertinoro's commentary on Esther (Venice, 1585); "Miftaḥ ha-Zohar," index of Biblical passages found in the Zohar and additions from old manuscripts (ib. 1566); "ḳehillat Ya'aḳob," cabalistic commentary on Ecclesiastes (ib. 1577-78); Responsa, with additions by his son Jedidiah (ib. 1608). 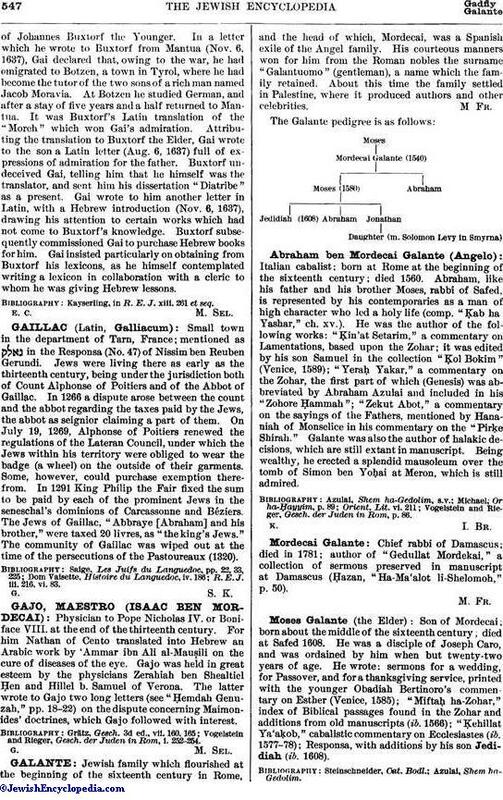 Son of Jonathan and grandson of Moses Galante the Elder; born 1621; died at Jerusalem Feb. 4, 1689. He wrote: "Zebaḥ ha-Shelamim," a harmonization of contradictory Biblical passages and of Biblical with Talmudical statements (edited by his grandson Moses Ḥagis, Amsterdam, 1707-08), and "Ḳorban Ḥagigah," halakic and cabalistic novellæ (Venice, 1714). He was called with reference to the initials of his name. Some of his responsa are found in the works of contemporaries, and a volume of his responsa exists under the title "Elef ha-Magen," but has never been published. Hezekiah da Silva was among his disciples. Chief rabbi of Damascus; died 1806: son of Mordecai Galante. He was the author of "Berak Mosheh," responsa, Leghorn, 1780 (Ḥazan, "Ha-Ma alot li-Shelomoh").